Prince Edwards giant bluefin tuna fishing charter! 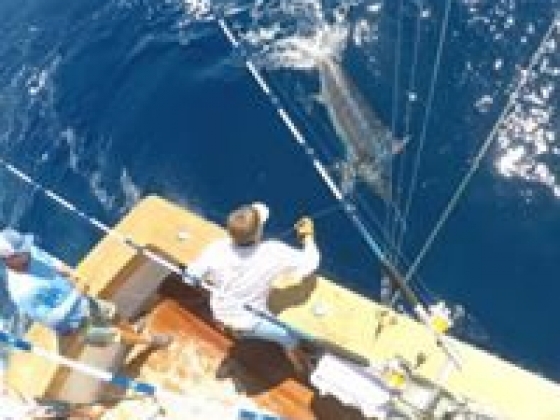 Top Notch Tuna Charters crew has 20 years of experience landing these monster fish. Since the water in Prince Edward Island is colder, the bigger fish migrate towards North Lake to feed on baitfish. With that, Captain Jenkins has been hand feeding the Giant Bluefin Tuna right off the boat. This is why it's normal to land an 800-1100 pounder on any given day. When on board one of the tuna charters, you will have the chance to literally get up close and personal with Giant Bluefin tuna, one of the true giants of big game saltwater fishing. 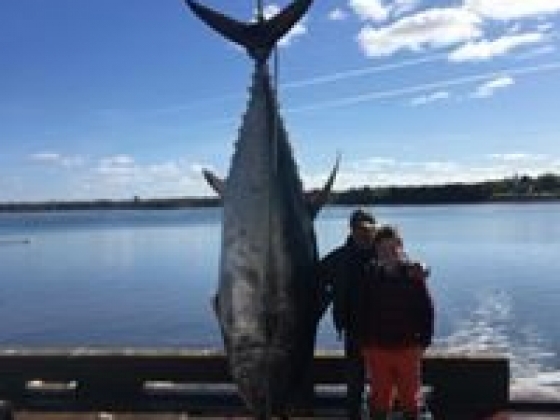 If you are looking to knock a Bluefin tuna off of your bucket list then take a tuna charter with Top Notch Tuna Charters, as the elusive Bluefin tuna can be found within minutes, only 5 miles off shore. 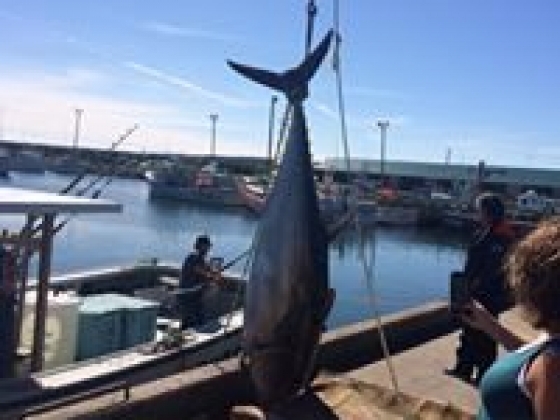 Tuna charters here on Prince Edward Island are on a catch and release basis. We use barbless circle hooks and gear that has a minimum breaking strength of 180lbs, as per government regulations. This allows us to catch and release Giant Bluefin tuna as healthy as possible. We take pride in our catch and release format during our tuna charters on P.E.I. as we want to preserve the magnificent Giant Bluefin tuna for further generations. Mark Jenkins has been fishing commercially for lobster and tuna for 20 years. He attended college and received papers for Electronic Engineering Technician. Two weeks after graduating he bought his fishing gear and has never looked back. Cody Jenkins, who is Mark’s brother, bought his fishing gear in 2009. Cody also went to school and studied electrical mechanical. These brothers are fourth generation fishermen, so it is pretty hard to keep them off the water. You will have a lot of fun with these guys on your tuna charter as you experience a thrill of a lifetime. The "Top Notch" is a 45 foot Four Ports Marin fiberglass boat launched in 2004. Aboard you will have ample power to cruise at 20 knots with speeds up to 26 knots, powered by a 660 HP Diesel Cat engine. Included on the "Top Notch" is: Private bathroom Microwave Tables Furnace Bunks 3500 watt power converter GPS 2 VHS Radios Color sounder Fighting chair Stand up gear *This boat is also Transport Canada approved as a passenger-carrying vessel, so it is equipped with all safety gear. Top Notch Tuna Charters can accommodate up to six people. The rate is for the boat, not per person. So it is the same price for one person and six people. What to bring aboard "Top Notch" Top Notch will supply all bait and gear for the passengers. All you need to bring is your game face on! 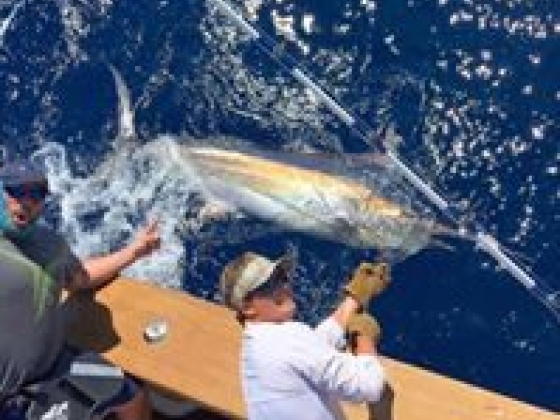 Top Notch Tuna Charters also provides rods and reels for the fighting chair as well as lighter stand-up gear with a harness. If you want to bring your own gear, your more than welcome to! Worried about being hungry on the boat? Well, Top Notch Tuna Charters will supply refreshments and a light lunch. Please let us know World Wide Fishing Guide sent you.